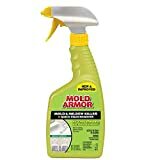 If you’re a Do-It-Yourselfer, and are looking for a product to help you get rid of mold quickly and easily, consider investing in Mold Armor. This 32-ounce spray-on product is bleach-based, but more powerful than bleach alone, or the bleach and water mixture you can make yourself. The product says that no scrubbing is required for cleaning, but in practice, this is going to depend on the size and intensity of the infestation, and the darkness of the stain the mold growth has left behind. This is much too strong for use on delicate items, including clothing. Its main purpose is to use on a variety of household surfaces, especially tubs, sinks, toilets and counter tops. It can be used on fiberglass and shower doors as well, and although the product’s description says that it’s okay to use it on vinyl shower curtains, understand that because it is bleach-based and highly concentrated, doing so will probably lead to some color loss. The two biggest upsides to this product are its ease of use and strength. This is the closest thing you’re likely to find to an industrial-strength cleaner for home use. As such, this product should be reserved for the really big jobs, whereas the smaller jobs, and removing mold from more delicate items such as clothing should probably be tackled by homemade mold removal concoctions (link to the post, removing mold from fabric). As for ease of use, it couldn’t be simply, simply point, spray and wipe. Again, although the product description indicates no scrubbing needed, in practice, you’ll find that for the most pervasive stains, you’ll need to apply a little elbow grease, but that shouldn’t surprise anyone. This product is extremely strong and potent, as is the odor it gives off when you spray it from the bottle. Some users have reported nausea and a burning sensation in their eyes, nose and lungs. If you’re going to use it, it’s best to play it safe and wear a mask and gloves, lest you risk getting the cleaner on your hands and/or breathing in the toxic fumes. An extremely potent mold removal solution, and a good addition to your home arsenal. It’s not without its drawbacks and limitations, and if you’ve got respiratory problems, you’ll probably want to hand the spray bottle to someone who’s less likely to be affected by the fumes, but in those cases where your homemade mold removal solutions aren’t getting the job done, it’s nice to have a stronger solution within arm’s reach. Highly recommended. We give it 4.5 stars out of five, deducting half a star for its limitations and the fact that some people will be unable to use the product due to the intensity of the fumes. For those who can handle it though, it’s a solid solution. This is a good product to use in tandem with Mold Armor (FG516) Mold Blocker.